These are the cheapest data plans you can buy in the U.S.
Have a carrier in mind or just looking for a cheap plan? Here are the cheapest plans you can get from every one. All prices valid as of January 21, 2019. If you're hellbent on saving money on your wireless plan, then you have to get away from the Big Four carriers (T-Mobile, AT&T, Sprint, Verizon). Smaller carriers, called mobile virtual network operators (MVNOs) or alternative carriers, lease coverage from the larger networks and resell it for less. That being said, depending on your usage and needs, a plan from one of the Big Four might actually be your least expensive option. Here we go. Before you choose a carrier and/or a wireless plan, it's best to first determine your needs and usage habits. If this is your first smartphone, I'd like to first welcome you to the 21st Century and secondly encourage you to try out your options without getting yourself into any yearly or multi-year contracts. If this ain't your first rodeo, then reflect on your phone habits from the past. How much data have you actually used in an average month? Do you really need an unlimited plan or are you actually on Wi-Fi more than you realize? Could you benefit from an international plan of sorts? Take time to analyze your usage and then choose the plan that best fits those needs. Most carriers are more concerned with making you overbuy by convincing you that you need unlimited everything, when the fact is that 90% of Americans don't. Don't let carriers dictate what they think you need, because it will almost always be much more than what's necessary. Figure out what you need and make carriers work for you. You could opt for the cheapest data plan there is, but if you end up using more than what's allotted, you could pay far more in overages when you could've just picked the right plan for you. See if these options fit your usage habits. 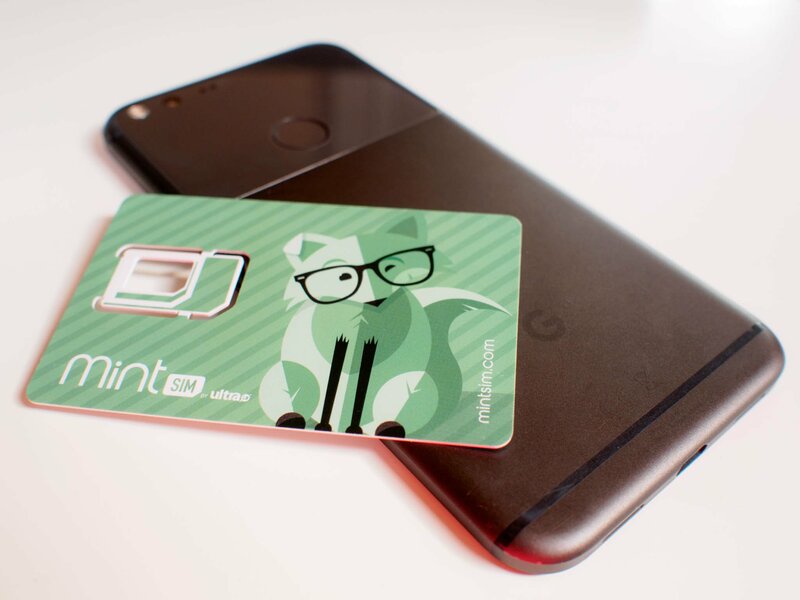 Mint Mobile: Mint Mobile is an MVNO that leases coverage from T-Mobile. You don't sign up for a contract, but you pay in advance for 3 months, 6 months, or 12 months, saving you more money the longer the term. Read our review for more. Republic Wireless: Republic operates on the Sprint and T-Mobile networks. No fixed contract required. It encourages users to spend time on Wi-Fi by making it easy to automatically connect to many hotspots around the country. Project Fi: Project Fi is owned by Google and operates on the T-Mobile, Sprint, and U.S. Cellular networks. Project Fi's most interesting feature is the refund you get for data you pay for but don't use. MetroPCS: MetroPCS is owned by T-Mobile and operates on the T-Mobile network. Its cheapest monthly plan includes all taxes and regulatory fees and requires no contract. Boost Mobile: Boost is owned by Sprint and therefore uses its network. You just pay month to month, with no contract necessary. Cricket Wireless: Cricket is owned by AT&T and operates on the AT&T network. You pay monthly for Cricket, with no fixed contract. Mint Mobile: Mint Mobile is owned by Ultra Mobile and operates on the T-Mobile network. You pay upfront for 3 months, 6 months, or 12 months. The longer your term, the more money you save. Simple Mobile: Simple Mobile is owned by TracFone Wireless and operates on the T-Mobile network. No fixed contract required. If you're one of the few people who uses more than 10GB of data per month, then you'll probably want to go with an "unlimited" plan from one carrier or another. These plans will usually give you 4G LTE up to around 20GB per month, and if you're going over that, then you deserve a medal. Keep in mind that no "unlimited" plan is truly unlimited. Every carrier has a certain cap, and after you reach said cap, your speeds will likely be slowed to 128Kbps (2G speeds). T-Mobile: T-Mobile is about as close to truly unlimited data as it gets, with a massive 50GB prioritization point. No fixed contract required. Boost Mobile: Boost is owned by Sprint and uses the Sprint network. No fixed contract required. MetroPCS: MetroPCS is owned by T-Mobile and operates on its network. No fixed contract required. Cricket Wireless: Cricket is owned by and operates on AT&T's network. No fixed contract required. T-Mobile: T-Mobile's single-line unlimited plan isn't cheap, but if you have 4 lines, you end up saving $35/month per line. Cricket Wireless: Cricket is owned by AT&T and operates on the AT&T network. No fixed contract required. Boost Mobile: Boost is owned by Sprint and operates on the Sprint network. No fixed contract required. If you often travel internationally or you have family abroad, then you'll want a carrier with a good international calling plan for cheap. Project Fi: Owned by Google and operates on the T-Mobile, Sprint, and U.S. Cellular networks. You can use your Project Fi data in 135 countries just like you would at home. Unlimited texting is also included, but international calling is subject to various fees. Boost Mobile: Boost is owned by and operates on Sprint's network. No fixed contract required. What's included: Todo Mexico Plus gets you unlimited calling to and from all of Mexico, unlimited calls to Canada, unlimited international SMS (text) messaging, 8GB roaming data for Mexico. International Connect Plus gets you all of the above plus MMS messaging, unlimited calls to landlines in over 70 countries, 200 minutes to select mobiles lines in over 50 countries, and reduced per-minute rates to over 200 destinations. Virgin Mobile USA: Owned by Sprint, operating on the Sprint network. No fixed contract required. Virgin's international add-ons are essentially the same as Boost's because they're both owned and operated by Sprint. What's included: International includes unlimited calls to Mexico, unlimited calls to Canada (excluding Northern Territories), unlimited international text messaging. International+ includes all of the above plus unlimited calling to landlines in over 70 countries, 200 minutes to select mobile lines in over 50 countries, and reduced per-minute rates to over 200 destinations. Are you on a super cheap data plan? Let us know in the comments below and tell us about your experience! What are the advantages of going with an alternative carrier? Mint SIM vs. Cricket Wireless: Which is better for you?